Water-tight case for art exhibit. Or ... Clearly it's art. For his exhibit he planned to arrange standard living room furniture (e.g., couch, chairs, coffee table, etc.) inside the tank, then alternately fill and draw water in and out of the tank. It was a rumination on modern consumerism or something. I don't know, I'm not an artist. What I do know is that tanks are supposed to keep the fluid inside without leaking outside. Leaking water is a mess, but leaking sulfuric acid is an immediate and dangerous hazard to your health and safety. So regardless of what's in the tank, we aim to keep it there. Based on the customer’s specifications, we designed and built a tank 6 feet wide by 8 feet long by 8 feet high. After running our stress analysis calculations, we chose to build the tank using 1-1/2 inch thick clear acrylic sheet and it went without a hitch. 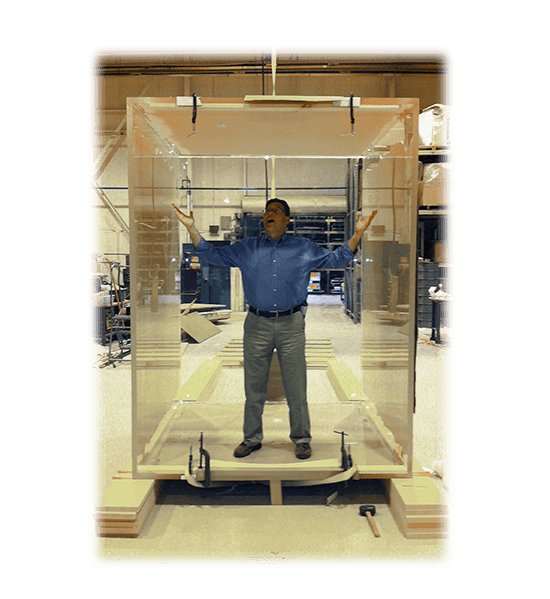 Until transparent aluminum is commercially available, we’ll stick with acrylic sheet. The initial showing at the Museum of Contemporary Art in Detroit was a big hit, and the exhibit was invited to show in Los Angeles.